Clara Southern painted this work in the Summer of 1911, in the garden of Professor Osborne’s property, ‘Lowestoft’, North Warrandyte. Situated at the end of Osborne Road, the house and garden, including the large pines in the background, were destroyed in a bushfire early in 1939. The work is one of considerable warmth, sensitivity and observation. It depicts Audrey, born 17th October 1905, and oldest of Professor Osborne’s four children, seated by one of the pine trees. 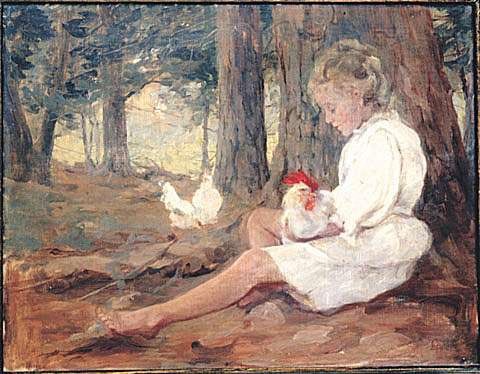 In her lap she holds ‘Chickapick’, the family rooster, who looks to be resting comfortably, yet is also ever watchful.